Functional as it is powerful, the Belkin's 7-port Plus USB 2.0 Hub is a reminder not to judge a hub by its color scheme. The Belkin Plus Hub bears a rather unique design. Measuring 6″ x 3.5″ x 3/4″ (1″ tall at the peak), the hub is rather thin, but a bit on the long side due to the USB ports being arranged horizontally instead of vertically. The end result is slightly more desk space being used, but when combined with the slim profile it makes the hub much more manageable when it’s being stacked. On the underside of the hub are four oversized rubber feet to keep the unit from sliding around on the desk. You’ll notice that in the center of the hub next to the two top-mounted USB ports is a small rectangular hole, meant for stacking on top of another 7-port Plus Hub’s two USB ports for a snug fit. The hole is surrounded by a large section of blue molded rubber that contrasts with the hard white plastic that makes up the rest of the hub. 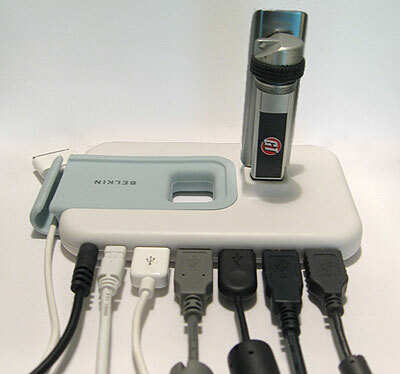 In addition to stacking on top of another 7-port Plus Hub, the blue section also serves as a base for stacking Belkin’s smaller 4-Port Plus USB 2.0 Hub. If the hub isn’t being stacked however, the hole can make the overall appearance somewhat awkward. For both models, the molded plastic turns into a cable management clip on the right side of the hub for keeping your PDA and iPod data cables handy. Hidden underneath the white plastic towards the front of the hub are 7 green LEDs to indicate the status of connected devices, as well as one orange LED to indicate the hub is receiving power from the oversized wall wart. The ports and LEDs are unnumbered, so troubleshooting a connection issue may be slightly more problematic for some. Really the only design issue I find here is the baby blue and white color scheme, which is simply a matter of tastes. Thankfully a darker brown and white scheme is also available. As a technology enthusiast, gamer and overclocker, I’ve never been one to go easy on my hardware. I expect things to run at full capacity without any crashes or hiccups. Despite it being a mere peripheral, the Plus USB 2.0 Hub is no exception and received no mercy from me. 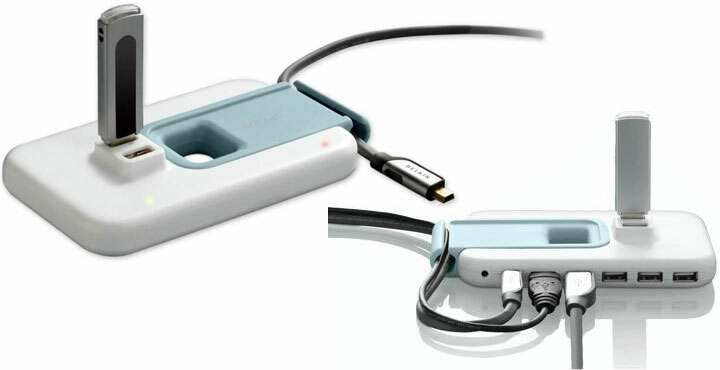 Thankfully, Belkin passed with flying colors. For the burn-in test, the Plus USB Hub was fully loaded with managing my Logitech G15 with a gaming mouse plugged into the keyboard, handling the video stream from a USB monitor, playing back the video from a USB 2.0 web camera, synchronizing my iPod while charging it as well as my cell phone, and transferring large files between two external hard drives. While I obviously had little bandwidth left over for the two hard drives, everything remained operational and no lock-ups or drops were encountered. The Plus Hub managed to get a little warm throughout the ordeal, but not nearly as hot as a laptop or hard drive can get. Speed was measured with SiSoftware Sandra using a 2.0GHz Core Duo Macbook and an ultra-fast Corsair Flash Survivor GT flash drive in three configurations: once with the drive plugged directly into the laptop with nothing else connected as a baseline, once with the drive plugged into the Plus Hub alone by itself, and once while plugged into the hub with 6 other commonly found devices connected, but not in use. These devices include a USB sound card with playback controls, an MP3 player, a webcam, a game pad, and two external hard drives. As you can see in the above results, using the Plus USB 2.0 Hub introduced no slow-downs when the drive was the only device connected, keeping more or less in line with the directly connected results, peaking at 23.5MBps. When the other six devices were connected but not in use however, performance dipped roughly 32% to 16MBps for the 64MB file test. Considering the hub must maintain internal communication between 7 devices including a game pad that uses an interrupt protocol, these results are actually pretty decent. Integrated cable management, top mounted ports for flash drives and the ability to stack both the 7 and 4-port models may be the main draws to Belkin’s 7-Port Plus USB 2.0 Hub, but being able to handle the harshest stress testing I’ve ever performed on a USB hub is no small feat in itself. And while the MSRP may be fairly high, with street prices hovering around $38 the Plus Hub makes for an inexpensive, quirky looking yet functional hub that doesn’t skimp on performance.